Iranian lawmakers published their view of what a nuclear deal with the P5+1 group should be, demanding a shorter term of restrictions, upgrade of centrifuges and continuation of enrichment at Fordo facility. The requirements were presented this week by the parliament’s Nuclear Committee and published by the FARS news agency. They include setting the time over which limits would be imposed on Iranian nuclear activities to five year compared to longer periods of 10 to 25 years, which were voiced earlier by the US. The lawmakers want research, development and production of new centrifuges to continue and that older centrifuges are gradually replaced with new ones. The committee agreed to ship spent nuclear fuel from the Arak heavy water reactor out of the country to address concerns over plutonium in it, but rejected the idea of rebuilding its core. It also demanded that enrichment at Frodo installation continued to levels under 5 percent. The lawmakers also demand that Iran not be subjected to any inspections that other signatories of the Nuclear Nonproliferation Treaty undergo. Iran and six major world powers held marathon talks in Lausanne, Switzerland, to agree on a framework deal on the controversial Iranian nuclear power program. It paves the way for a final deal to be finalized in summer. The only official papers released after the negotiations was a joint statement by EU High Representative Federica Mogherini and Iranian Foreign Minister Javad Zarif. 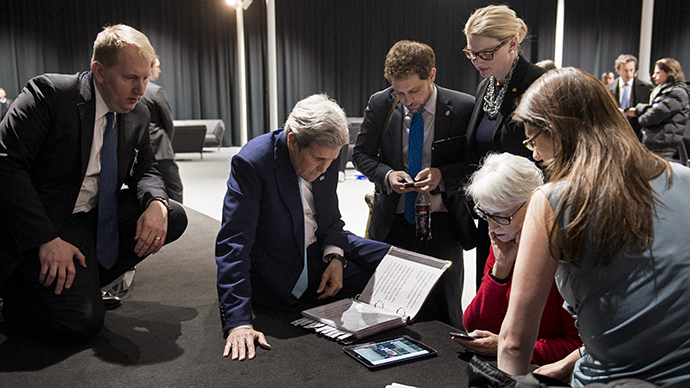 The US later presenteda five-page documentwith highlights of the future deal, which it said Iran had agreed to. This ‘factsheet’ released by the US State Department angered a number of Iranian officials, who said the Americans misreported or distorted key terms agreed to in Switzerland. The document also sparked fears in Iran that the deal the nuclear negotiators are aiming at now would compromise Iranian interests too much. The Iranian parliament voted last Sunday to demand an accurate factsheet from the team. "The Americans did it in written form... and our narrative which was a real one was thoroughly expressed in Mr. Zarif's remarks. We don't intend to publish it in writing yet, but we will do so if necessary," a senior Iranian nuclear negotiator said last week prior to the revelation of the parliament’s letter demanding explanations. The document detailing the Iranian committee’s stance on the issue is called a ‘factsheet’ as well in an apparent snub to the American paper. Unlike the American version it does not purport to represent the framework deal reached by Iran and P5+1, but rather suggests what the final deal should be. The Iranian committee’s stance not only rejects the US version but also demands an alteration to the Lausanne statement. The statement said the Fordo reactor would be converted in a way to prevent it producing weapon-grade plutonium, and that Iran would sign up to additional monitoring by the UN nuclear watchdog. The document comes after it was revealed that US Congress would have a say on the future nuclear deal and that the Obama Administration agreed to the latest version of a bipartisan bill warranting that. The bill was unanimously voted for by the Senate’s Foreign Relations Committee earlier this week. The White House softened its position after months of pressure from Israel and its allies in the US legislature. Israel appears to perceive any deal that Iran would be willing to sign as a threat to its national security. While the quarrel between Washington and Tehran over the details of the would-be deal is far from being hidden, the differences are be far more profound than they appear, political commentator Marwa Osman told RT. She said issues such as verifying Iran follow the deal, the conditions under which Iran would be considered to be violating the deal, with sanctions being resumed, or the US wish to investigate past nuclear activities in Iran are all very sensitive and must be addressed in the deal.